Samuel Huntington’s concept of the clash of civilizations has always met with justified skepticism. Moreover, a number of experts have even started talking about the fusion of civilizations . One thing is clear so far: throughout the history of the human race all wars of aggression have been come under the banner of a so-called “civilizing” mission. In the modern world, wars are divided into just and unjust, and, with the emergence of the UN, into legitimate and illegitimate. Many international organizations have introduced in their charters norms on the recognition of wars, as well as armed and border conflicts, as either legally justified or in violation of international law. No doubt, the right to use force continues to be a prerogative of just a few countries. Such major countries as the United States, Russia, China, India, and European states have opponents that often take the shape of religious extremists. However, for some reason these states do not pool their efforts to fight their opponents together. At the same time these same opponents are also avowed enemies of many Muslim states. The issue of civilizational identity is not obvious from the viewpoint of the unity of religious preferences. I believe that in terms of civilization Muslim countries fall into different categories, such as the Arab Islamic civilization, South East Asian civilization and Central Asian civilization that has a mostly Soviet foundation. The same is true of Christianity, for instance, Catholics in Europe, Africa and Asia or Orthodox believers in Russia and Ethiopia, or Buddhism in India, China or Japan. Therefore, religion is a fairly dubious basis for civilizational identity. One of the most important reasons for the emergence of the “clash of civilizations” idea seems to be the assertion that there will be a gradual levelling off of the global confrontation between the West and non-West. All recovering or newly growing civilizations are clearly attempting to set themselves in opposition to the West in different ways. We are now witnessing fairly tough competition between development concepts. The obviоus reasons for this are economic growth, the greater geopolitical potentialities of the developing nations, globalization and the internet. There are international associations and organizations in the world that unite different civilizations. The combination of civilizations in the SCO, for one, is truly unique. Is it possible to talk about a dialogue of civilizations and is such dialogue feasible at all? What could serve as the foundation for it? For instance, an important role is played by the broad involvement in bilateral and multilateral relations of the main principles and ideas of the philosophy of peace, harmony and development that are present in all new and old philosophy schools of the SCO member countries. The harmony of values of different civilizations may be achieved through their dialogue. On the one hand, the renewed “Shanghai spirit” may become the foundation for the dialogue of civilizations in the SCO. In this case, I am referring to broader principles and ideas, especially after the SCO’s expansion. On the other hand, the SCO unites states that are, first, economically independent, and, second, undergoing powerful and comprehensive development that determines their active participation in the formation of a new political and economic order and a new system of international relations. It is important to remember that the post-communist state of the SCO members as a space of certain mixed values supported by traditional guidelines prevents them from being automatically integrated into the Western value space. Is it possible to talk about some common values, as well as political and other guidelines for post-communist states? In general, the answer is positive, although many of the parameters of post-communist existence described below are also inherent in other communities. Second, all post-communist states reject westernization by government agencies. Submission to the flow of Western ideas, values, equipment, technology, fashion and food in everyday life is considered paradoxical. Third, there are obvious attempts to bring closer, if not to unite, the ideological concepts of “tough” and “soft” communism and traditionalism, as well as some timid ideas of liberalism. Obviously, the period of transition is being aggravated by the fact that these attempts succeed in some countries, do not achieve much in others, and altogether fail in still other states. Fourth, communist ideas that are not labeled as such in some countries for some reason are a stable presence in society and the political establishment. Fifth, the idea of domestic development within the confines of the relevant civilizational and religious identity is permanently expanding and growing stronger. Sixth, there is a coexistence of various, sometimes contradictory, economic patterns. In this context, the formation in the post-communist community of ideas and values that would attract other states and nations is becoming a priority. They may serve as a foundation for a new stage in the development of mankind. 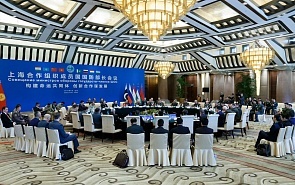 Clearly, participation of the SCO member states in the formation of the new order, along with the values of the developing nations and the post-communist space could serve as a foundation for inter-civilizational dialogue in the framework of this international organization with a view to designing a “soft” Eurasian identity. Кishore Mahbubani and Lawrence Summers, “The Fusion of Civilizations,” Russia in Global Affairs, No. 5, September-October, 2016.